Mobility and safety are the primary advantages of this sturdy kiln cart. Made of heavy-gauge steel, it includes three heat-proof, non-asbestos, heat-resistant panels that fit inside the trays. 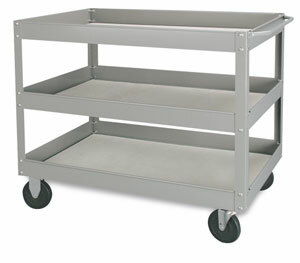 This cart will hold up to 150 lbs (68 kg) per shelf. Wheels are 4" diameter with two swivel casters. Shipping weight is 80 lbs (36 kg).